The Dublin of my childhood and youth has changed. Now it has taken a tip from Amsterdam, and It is fast becoming a city of cyclists again. 450 specially-made bicycles are available from 40 stations run by the JC Decaux company, are free for the first half hour of use. 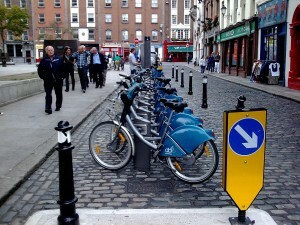 It is an effort by the Dublin City council to reduce carbon emissions and make the Irish capital a green city. Beside each bank of bikes is a pay station. You need a credit card to use one of the bikes. 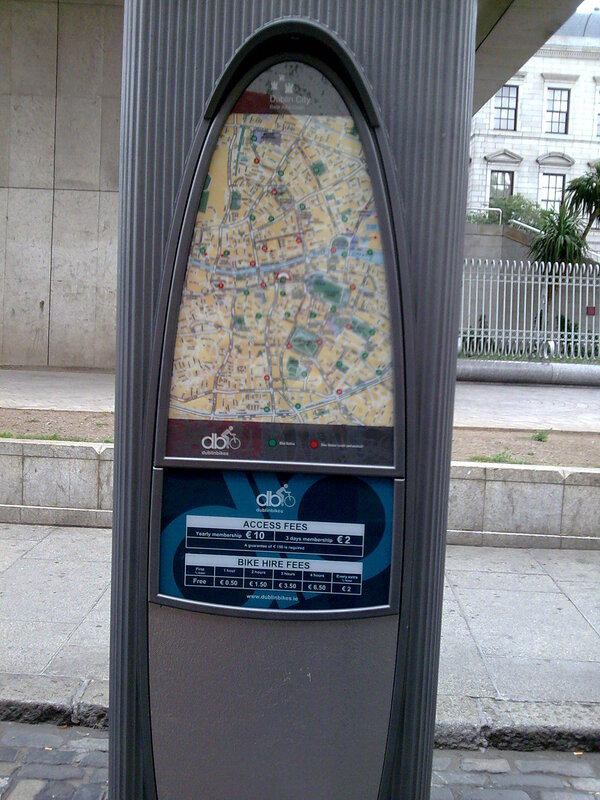 The machine is free for the first half an hour, but costs €0.50 ( ($0.67) for the first full hour, and €6.50 for four hours. This ensures that riders don’t leave them lying around, otherwise the final charge on their credit card would be substantial.Subscription for the 3 Day Ticket costs €2, which is debited from your account at the end of the subscription period. The Long Term Hire Card costs €10 and is taken from your credit card, or your bank account by direct debit. Please note that VISA Electron and Laser Maestro debit cards are not accepted. On subscription, you also authorise the provider to request a €150 guarantee from your account. This amount will not be debited unless the bike is not returned after a period of 24 hours. 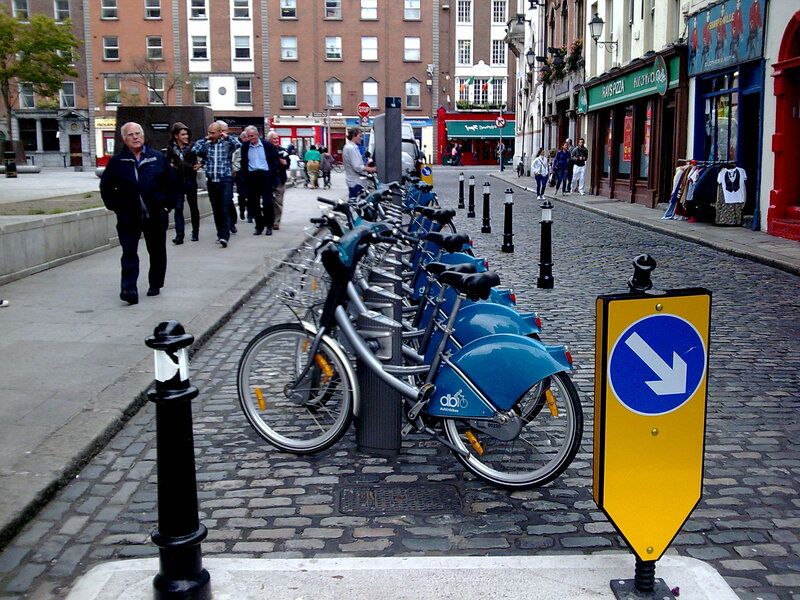 Both subscriptions allow you to rent a Dublin bike as many times as you wish during the period covered by your subscription. However, if you exceed the first half hour which is free, the service charge is debited at the end of the subscription period (in the case of the 3 Day Ticket), or monthly (in the case of the Long Term Hire Card). I’m not sure about cycling in traffic with this hip of mine, so I’ll use Shank’s mare as usual. This entry was posted in Ireland, Travel on August 14, 2010 by Grannymar.